Stunned and amazed. Like a deer in headlights. When you take a left turn from the domain of logic and reason and engage with heart and soul, the experience can leave you almost breathless. These experiences come out of the blue and strike like lightning; fast and sharp, a bolt through the heart from the gods beyond the clouds. And when you just go with it and don’t resist, that’s when the magic happens. At least that’s our working hypothesis. I reacted in my usual calm, self assured and reasonable way. I went and bought a pair of shoes so I could think about it. It’s spring and I had no flats to wear for work. That night Mike and I had a little meeting of the minds about this thing over dinner. And we decided that we really do both love that boat, in spite of the fact that it is too big. Neither of us felt much concern about it being made of wood. We’re familiar with wood, love wood, know how to work on wood. How can you beat a Sparkman and Stephens design for sheer beauty and sailing characteristics? It was built by the Henry C. Grebe boatyard, a yard famous for its quality. The provenance of this boat cannot be beat. And where could we ever find another boat with the kind of fascinating history this one has; one that appears to be in such good condition, with this amount of work having already been completed? For the right price, we could be ahead of the game with this boat, if the survey checked out. But the listing price was out of our ballpark. There is love, and then there is crazy love. We are not crazy, in spite of what some people say. The wheelhouse that started it all. We called Lee and told him we were serious but we wanted to talk to the owner. We had a LOT of questions and were unimpressed by the amount of information we had so far. This was us being reasonable and thinking with our heads. And it was a bit of an effort, I can tell you, because I felt like the boat had already chosen us as the next caretakers, so it was going to take a lot to keep it from happening. But I’m known to think that way. Lee promptly responded with the guy’s phone number, contacted the owner and got permission for us to call. The next day, yesterday, Mike and the owner had their own little meeting of the minds over the phone. The owner has circumnavigated twice, and sailed around the horn. This person knows sailing and sailboats. He told us how the fiberglass skin had been attached to the hull: the right way apparently, and it has held up beautifully since it was done in the early 1990’s. He told us many other things about it such as that the engine had been completely rebuilt and had less than 700 hours on it. The sails were new in 2004. 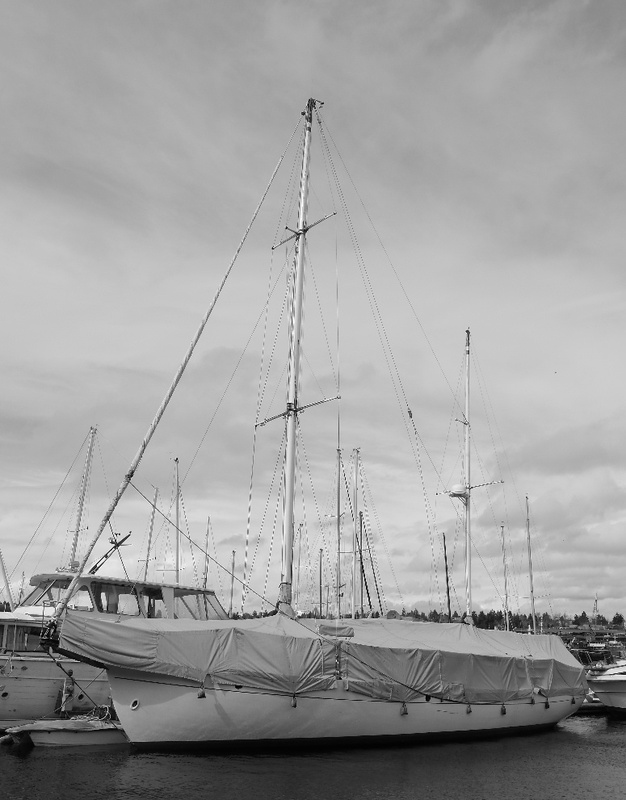 The masts were completely serviced in 2008, reset, sealed with spartite. The beautiful military grade windlass works great. So great you have to be careful with it. Mike said we’d be in touch. Then we got busy crunching some numbers. Yesterday we went to the broker’s office and made two different offers, one with a low cash price and us bearing the risk of continuing to try to sell Moonrise. The other with an even lower cash price, but he could have our boat and sell it, eventually making more on his boat. Honestly, we could live with it either way because we offered a price we knew we could afford right now, even if we had to wait a few months for our boat to sell. It was a little financially risky, but not so much that it would keep us up at night. Frankly, we were sorry this owner might have to sell this boat for so little, considering the amount he’s put into it. But financial statements don’t lie, and we can’t afford to get in over our heads at this point in the game. We might be in love, but we still have to be careful. If he wanted us as the next caretakers of Flying Gull, this was as good as we could give. And we were willing to walk away. We truly were. This owner accepted our cash price offer within the hour. And we couldn’t believe it. That was when the stunned amazement began. We drove down to visit Flying Gull and look at a couple of small things we couldn’t remember seeing. Our daughter, who is considering living aboard her for awhile, came with us. While we were there the heavens opened, the thunder and lightning came, and we were deluged with hail. This was no small spring squall. This went on for an extraordinarily long time and if you live in Seattle and are reading this, you know what I’m talking about! The hail just kept coming, building up on the docks, covering the boats with several inches of ice. 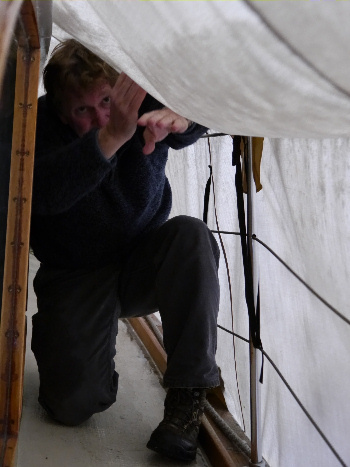 The noise was deafening, but we had our first ‘heavy weather’ bonding experience with her as we tunneled around like moles underneath the boat cover pushing it up to keep the weight of the ice from bringing it down or putting undue stress on the stanchions. Thank goodness we were there because it would have been a bad situation considering the sheer amount of ice that fell from the sky. Claire said it was our ‘congratulations’ from the weather gods; their version of throwing confetti. So our cunning little plan is beginning in earnest right now. If this works out (survey, sea trial still to come) we’ll have a boat that can literally take us anywhere in comfort. It has a most versatile sail plan, enough room for everyone in our family, and the ability to keep us sheltered from weather of all kinds while under sail if we so choose. In addition, we’ve already begun meeting people who know a great deal about wooden boats and have been incredibly encouraging, including the owner of sister ship ‘Awab’, currently moored on the east coast. If in reading this you think I make it sound as though this is a done deal, don’t be fooled because in all honesty, that changes moment by moment. Our mood shifts rapidly from excitement to sheer, unadulterated terror. Five hundred gallons of fuel? Dear God! We know in choosing this boat we are walking away from smaller, easier, cheaper-to-operate boats with simpler systems, boats like Moonrise that we can take out on a whim and just have fun. We know this is counter to the common wisdom out there. In our more lucid periods, we don’t know if that’s really what we want. That’s why the emotional roller coaster has such profound highs and lows. Claire, watching the confetti fall from the sky. What we do know is that in order to really engage with a boat enough to get the feel of the thing, you have to make an offer. You have to be willing to gamble the price of a survey. Without an offer, there will be no sea trial, no survey, no chance to see if the boat is a good fit. And when the gods practically drop it into your lap, it seems a little ungrateful not to at least give it a try. That’s the issue with gifts from the heavens. You don’t know at first if they are meant to be kept, or whether they’ve shown up simply to make your choices that much more clear. It’s like the gods sit back and say, ‘You can have this, and everything that comes with it, if you want it. Or you can take the other road.’ Gods are tricky. How do we know they don’t consider us part of some divine comedy? This deal is far from done in our book. We are still willing to walk away if it looks like that’s the best thing to do. Three days ago we were happily contemplating our next boat after Moonrise sells, even looking forward to the shopping process. We were settled in our logical, plodding progress toward the final goal. We were planning trips to unknown destinations, just to view boats. Now we are just steps away from owning another boat. It’s happening very fast. We’re just trying to hang on for the ride. In spite of all of this, Flying Gull speaks to us well below the threshold of logic, whispering to our hearts in a way only we can hear. I know she is trying to hold us steady during this most tumultuous time. And I appreciate the effort. This entry was posted in Boat Search, Buying and selling Boats, Preparing to cruise and tagged Boat shopping, boats by Melissa. Bookmark the permalink. I know EXACTLY how you are feeling…. Terror one minute and excitement the next… If you need a hand with anything… Just let me know! I bought the Catalina BTW…. Will be bringing her to Foss Harbour on Tuesday…. I am excited and Terrified for you! LOL…. Everything is relative. I doubt we would feel only a little less freaked out if the boat was a 38 footer. Any kind of new venture requires you to tamp down your fears. Congratulations on the new boat. We’ll no doubt see you at the marina. I look forward to a tour of the the Catalina 30. The photos made her look like a real find. I knew it!!! I 100% believe it will all work out because I just KNEW in my heart you and Flying Gull were destined for each other. Sure, there are lots of boats out there but not like this. I am so, so excited for you. Sending lots of good survey vibes and thoughts your way and I really do expect to have cocktails on her with you some day. LOL! I thought my sister was the only one who ‘squuueeed’. Thank you millions of times for believing. If it all works according to plan, you will be on this boat having cocktails with us. Oh my gosh, I held my breath from the first paragraph! My heart is jumping up and down for you guys! Daaaaannng! This is so completely awesome. Chart drawers! The wheel house of wheel houses! Room enough to dance & twirl in happy, combustive moments of glee. She’s beautiful, and you are the perfect stewards of her next adventures. Big wishes for a great survey and sea trial. Thanks Belinda! There is definitely enough room to dance on this boat! Even in that wheelhouse! We will not exhale until everything works out completely. And we are definitely still in the roller coaster stage of awareness. Haven’t seen your blog lately! I wonder why. I will check how it gets to me and make sure that all is working there. Looks like you are up to some spring boat projects on that beautiful boat of yours. I love seeing a fellow “squeeeeeer”! That said, you are remiss in not posting a picture of the new shoes. Also, It is killing me to be in Oregon so I cannot see this fine vessel first hand. (All in good time, Amy, all in good time.) I am doing a serious happy dance in your honor. Even though “serious” and “happy dance” seem oxymoronic, I do believe in this situation, it fits. You’ll be seeing it soon! Just keep your fingers crossed we can figure out how to get it out of the slip to go sailing without ramming the boats and boat houses on either side. Oy. This is going to be quite the learning curve. Stomach flutters of fear. Slow is pro. If you aren’t bored, you are going too fast. But you already know this. I found comfort when first maneuvering our boat (only 42 feet but a tight fairway) by putting out lots of fenders and manning the bow with a boat hook in hand. The good news is that the size of her will make her less susceptible to errant winds. You will get the hang of it in no time. Great idea with the fenders. I can imagine if all things fall into place with this boat, we will be doing a LOT of slow, steady practicing. We haven’t closed on the boat yet, and there is a lot of ‘water’ to pass over between now and then. We hold our proverbial breath. Thanks for commenting! That is some CRAZY hail! Exciting times … best wishes! We’ll be anxiously awaiting to hear how things go. This is VERY exciting! I really hope the survey is good. I’ll stay tuned!! Hi Dani! Thanks! I really am more concerned about the sea trial. This is a very big boat and I want to be sure we can handle it easily together. Mike has concerns about that, too, and in spite of it being an incredible price for this boat, we’ll have it for a long time if everything goes through. We have to be as double dog sure as we can be that it’s the right thing. We will keep the blog updated as things unfold. Sounds like you’re having a wonderful time. The Nor’sea 27 is just the kind of boat we hope our son will look at when he is ready for his next boat. It’s just perfect for what he wants to do. We’ll be spending a few hours aboard Flying Gull on Wednesday, doing exactly as you say. It’s going to be weird so I hope we can feel comfortable with it. The day looks to be a beautiful sunny one….with no wind. Darn it! There’s a couple Nor’seas available around. I know a much older one in Alaska and I think another one somewhere else. Whenever he’s ready to buy, he can join the owners group and post his interest in getting one. Sometimes, people will reply direct and sell without ever posting on any website. I did that and had a couple direct contacts. That’s a very good idea. He’ll need to find a good deal on any boat he gets since he’s just starting out in life (as an adult, that is). Thanks for the idea! How much did this boat sell for? Or what was it being offered for? What was your offer? I’m doing some research on the flying gull! Hi Greg, you can contact us through our ‘contact us’ page if you want to private discuss what we know about Flying Gull. We’re glad to share information if it can help.